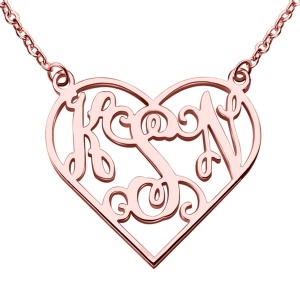 Rose Gold Heart Monogram Pendant Necklace 3 Initials - If you are looking for a present to impress your loved one. This unique Heart Monogram Necklace is a perfect trendy gift for a friend or yourself. This style of love monogram necklace is an adorable addition to any jewelry collection. This Silver Heart Initial Monogram Necklace can be made with the initials of your choice.